Organs are a bit of a lost art. However the beautiful music they make are being notice and are on a bit of a comeback. Whether you have experience in piano or keyboard, transitioning to organ is easy. Even if you have no experience, I can have you playing within weeks! Carey delivers an exceptional lesson experience and ranks in the top 15% of our teachers nationwide. Im a full time piano teacher. I began playing over 35 years ago and later turned my passion into a career. I have more than 15 years of professional training. I teach all genres and have students from age 2 to 65. I have a variety of methods that I use to teach. I teach preschool (3-5) private lessons. I also teach a preschool group lesson class. In addition, I teach all levels of piano & keyboard. My studio also teach acoustic and bass guitar, violin and drums. In addition to lesson courses, master theory, composition, audition preparation, performance preparation, and musical history courses. Our studio also offers a master sound system for performance recordings, audio recordings and musical demos. We are continually growing our studio and we strive to be the premier music studio and school in our geographical area. Offering music therapy to children, teens and adults with special needs as part of an interdisciplinary approached to their wellness. Using music therapy I work with special needs including autism, cerebral palsy, Down's syndrome, emotional and mental disturbances, developmental delays and others. Additionally, I work with teens and young adults with pshycosocial issues including, but not limited to anxiety, depression, grief, ADHD, ADD, personality disorders and more. I have been a professional pianist for more than 20 years now. I currently serve as our church pianist and have done so for several decades. In addition to playing in church, I have also played for weddings, funerals, etc. I have more than 5,000 hours of performance time, and I have more than 2,000 hours teaching. In addition to teaching the piano, I teach keyboard (including how to incorporate the many features), electric piano and I also teach guitar lessons. I do additionally teach in depth classes such as composition, advanced theory, ear training, sight reading beginning with primer level students all the way to my advanced students. I opened up my own studio several years ago and began teaching private and group lessons, as well as a general music program for younger children. Although I have always taught young kids, I never used any one specific reperotoire. That is until now; I have recently received certification from the WunderKeys Preschool Piano Lessons. They are specifically geared to 3-5 year old's and although skeptical at first, much to my delight, I have had nothing but tremendous success. It not only teaches piano but it is infused with math so as they are learning to read music, they are also learning basic mathematics. The parents have been so impressed and that teachers were taking notice that certain preschoolers were ahead of the game and excelling at a lighting rate. I have even starting teaching my own son, who is only 2 1/2, but he is already picking up on it. I also have my certification from KinderKeys Program. This is the program used for preschoolers, ages 2 - 5. (2 year old's require parent participation.) It is a tremendous music classes specifically designed to set them up so they may continue with private lessons and excel. The best part is that the children do not even need to own any instruments. All the instruments will be used in the studio during classes. Additionally, I teach group lessons to older kids in either just a group setting or as supplemental classes for my private students. Supplementing student's will continue to study a wide range of music lessons. As an older group lessons, I enjoy using the Piano Safari series. This also sets them up to continue on with private lessons. Although I have been instructing for many years, I have just recently started to give online lessons to students. I must say that I have had a tremendous success this way. I could continue to list things that have proven successful or not and list all my certifications, but I believe one of the most important things to make a successful teacher and in turn successful students, is to never push them in any direction they do not want to go. Therefore, every student is their own individual and I make sure that I cater to their needs. I allow them to decide the genre they wish to pursue because you may be the best teacher there is, but if you do not know your students and make them happy and enjoying music, they will lose interest. We are so excited for 2017 as we continue to expand our music studio. We will begin teaching two new instruments, drums and the violin, as well as voice training, & for the first time in my teaching history, we are offering a program in which students may join them band and participate in several performances. We have a few other plans, but we have chosen not to announce them quite yet. We are a year round studio meaning that a student may start at any time during the calendar year, provided there is open availability. I am fairly new to the TakeLessons program, so it may take me some time to enter all of my information so if you have any questions, please contact me and I will try and answer your questions to the best of my ability. Also, if you are interested in a specific class or program that I do NOT have listed, Please ask as well because I may offer it but just didn't have a chance to fill it in yet. 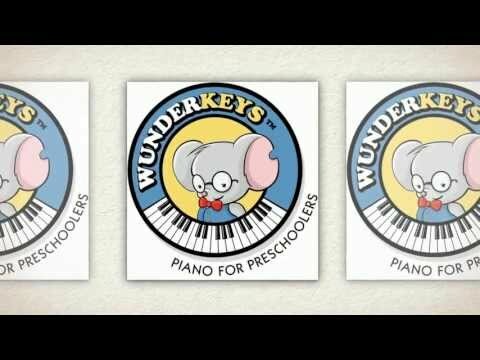 Wunderkeys is a unique blend of music and math that nourishes the intellectual and creative minds of young children. In development for 6 years, we have created something different… a real-deal, one-on-one piano program, that keeps preschoolers excited, motivated, and begging to learn more! I hope you’ll join us on our journey and enrich the lives of preschoolers everywhere. This AMAZING 5 year old student walked in for her first lesson, sat at the keyboard, and played "Mary Had a Little Lamb"